Libby Day was seven when her mother and two sisters were murdered in “The Satan Sacrifice” of Kinnakee, Kansas. She survived—and famously testified that her fifteen-year-old brother, Ben, was the killer. Twenty-five years later, the Kill Club—a secret secret society obsessed with notorious crimes—locates Libby and pumps her for details. They hope to discover proof that may free Ben. Libby hopes to turn a profit off her tragic history: She’ll reconnect with the players from that night and report her findings to the club—for a fee. As Libby’s search takes her from shabby Missouri strip clubs to abandoned Oklahoma tourist towns, the unimaginable truth emerges, and Libby finds herself right back where she started—on the run from a killer. Well then, this book was a little intense compared to the silly, light, & refreshing book I reread right before diving into this one! 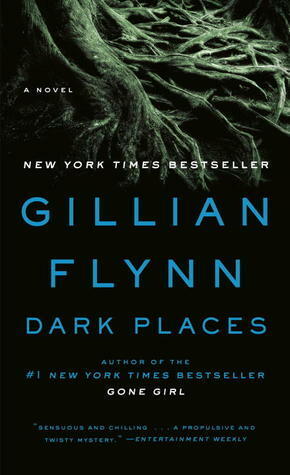 I decided to pick up Dark Places as I really enjoyed Gone Girl. (Which I apparently read way back in 2013!) I was in the “mood” for something a little darker, and this definitely filled that request. Dark Places takes you back and forth between the past and present, going between Patty and Ben before the murders happened, and Libby during the present day as she tries to figure out what actually happened. There ends up being a lot of finger pointing as to who may have killed the Days, and I thought I had figured out what had happened a couple of different times but alas, I was WAY wrong. The characters were all well developed, but I would’ve liked to know more about Debbie and Michelle, and perhaps even Runner. Overall, I definitely recommend this book, and I’ll give it ★★★★½ / 5. Maybe read it in the summer in the sunshine though, as it’s pretty heavy for a dreary winter read.